In 1997, Andrew Nathan and Robert Ross co-authored The Great Wall and the Empty Fortress: China’s Search for Security. 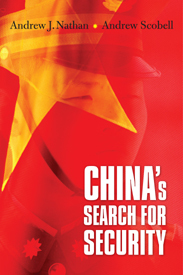 The second edition, China’s Search for Security, taking the subtitle of the first, came out in 2012, with Andrew Scobell replacing Ross as co-author. Though much has changed in the intervening period, the conclusion remains the same: “China is too bogged down in the security challenges within and around its borders to threaten the West unless the West weakens itself to the point of creating a power vacuum” (xi). China’s Search for Security is a thorough treatment of China’s security policies, broadly defined. Nathan and Scobell set an ambitious scope for themselves, covering international relations theory, policymaking processes, economics, military modernization, human rights, history of conflicts and negotiations, analyses of regional systems, and policy recommendations to the U.S. government. While a host of other academic works on China address these topics, China’s Search for Security stands out as a self-consciously sympathetic presentation of China’s international engagement. To understand the “why” and “how,” the authors take the point of view of Chinese policymakers. This approach is not as common among U.S. literature on Chinese foreign policy, which makes Nathan and Scobell worth reading. Not only are the authors explicit about their analytic approach, they also present their theoretical assumptions. Nathan and Scobell contend for realism as the proper paradigm to understand China’s foreign policy. Chinese policymaking is usually rational (as opposed to driven by nationalism, culture, or “century of humiliation” victimhood) with the goal being national self-interest. Being written from a realist perspective, five aspects of power run throughout the book–military power, economic power, interdependence-power, diplomatic power, and soft power. The authors also acknowledge constructivism and institutionalism as complementary, yet secondary, schools that can help explain Chinese behavior. Liberalism, on the other hand, has limited use, since Chinese foreign policy is made by a small elite group without necessary consultation with other entities or society-at-large. First Ring: the territory China administers (i.e., domestic threats, including Taiwan, Tibet, Xinjiang, etc.). Second Ring: twenty countries adjacent to China that form a circle including Japan, Vietnam, India, Central Asian countries, and Russia. Taiwan is included in both this ring and the first, as well as the United States due to its power projection capabilities and military presence. Third Ring: six multistate regional systems–Northeast Asia, Oceania, continental Southeast Asia, maritime Southeast Asia, South Asia, and Central Asia. Fourth Ring: the rest of the world, including Europe, the Middle East, Africa, and the Americas. The authors aim to show how China’s percpetion and response to threats in all four rings are best explained by realism. Chinese cultural ideas such as “face,” moralistic rhetoric emanating from Beijing, and nationalism are all undergirded by realist goals. Territorial integrity: restore territories lost and maintain current terriories. Prevent external powers from dominating Asia and increasing Chinese influence in the region. Shape the global order toward Chinese preferences. Chapters 2 and 4 (“Who Runs Chinese Foreign Policy?” and “Deciphering the U.S. Threat”) offers a view of Washington from Beijing. This is Nathan and Scobell at their best. Readers cannot come away without a better appreciation of the complexities of managing the U.S.-China relationship and the careful calibration required. China’s Search for Security manages to blend discussion of how Chinese foreign policy is developed with the history of how the process evolved. The authors couple this with Chinese perception of the U.S. policymaking process, which is more confusing than U.S. citizens may at first realize. The dynamic between the executive branch and Congress, not to mention the opinion of the masses, creates many opportunities for erroneous signalling to international partners and adversaries. Nathan and Scobell show how “[i]t is easy to interpret the uncoordinated words and actions of diverse actors in the complex U.S. political scene as elements of a coordinated scheme to weaken China” (56). The rest of the book follows a clear logic–each ring is taken in turn. In the Second Ring, China faces a crowded and suspicious geopolitical environment wherein all neighbors are “cultural strangers” to China. Chapter 5, dedicated to the Second Ring, focuses on Northeast Asia. Contrary to Susan Shirk’s argument in Fragile Superpower, Nathan and Scobell contend that “[c]onflicts over history and memory serve as signals rather than drivers of policy” (124), which aligns with their realist paradigm. In the Third Ring, Nathan and Scobell describe the diplomatic finesse required of China. Beijing oftentimes cannot deal with these Third Ring countries bilaterally, but rather must do so within regional arrangements. The U.S. complicates this even further by being part of all six regional systems. The authors walk readers through each of the regional systems and the threats China sees and the steps Beijing has taken to counteract these threats. In the Fourth Ring, China’s engagements are strictly commercial and diplomatic, usually for the sake of energy resources, commodities, markets, investment opportunities, or political support in regards to territories (e.g., Tibet, Xinjiang, Taiwan) or interntational regimes (e.g., human rights, trade, environment). The First Ring, the most important for Chinese policymakers, is saved for last. In the First Ring, a large number of foreign influencers pressure Beijing, whether it be political, economic, or cultural. Nathan and Scobell dedicate the entirety of Part 3 to the issues of Tibet, Xinjiang, Hong Kong, and Taiwan. Due to the importance of Taiwan to Beijing’s geopolitical calculus, it is natural that they dedicate a chapter solely to the history of Taiwan’s democratic transition and the reaction from the mainland. China’s Search for Security ends with a treatment of three of the aforementioned aspects of power. The authors describe China’s plunge into the international economy, both the benefits and drawbacks. As China adjusted its economy to meet international standards of trade and finance, it became vulnerable to shocks in the global economy and now held a stake in the United States’ economic health. At the same time, China developed its own economic agenda to push back against some of these norms. The second type of power treated is the military and the modernization efforts of the People’s Liberation Army (PLA). The Tiananmen 1989 incident coupled with the successive fall of Communist regimes (1990-1991) instigated the Chinese Communist Party (CCP) to step up domestic security and tie the PLA close to the CCP. The overwhelming U.S. victory in the Gulf War taught the CCP the seismic transformation known as the Americans’ Revolution in Military Affairs, which bequeathed the U.S. military with information technologies used for complex logistics and weapon precision. Then in 1995-1996, Washington decided to station two aircraft carrier groups to the Taiwan Strait, forcing Chinese leaders to consider the need for a military solution to the Taiwan problem. These international military developments instigated the PLA’s military reform. From 1985’s “local war under modern conditions,” to 1993’s “high-technology conditions,” and finally 2002’s “local war under conditions of informatization,” the PLA adapted to the technology-intensive environment of modern warfare. Professionalization, a leaner force, and access-denial tactics were all logical steps. The third and final type of power addressed by Nathan and Scobell is soft power and human rights. China’s soft power is correlative with its economy–rising together. The story of China’s human rights record is well-known to most informed citizens of the United States, but perhaps not so well-known is the process of China joining human rights international organizations and its attempts to shape the conversation about human rights norms. In addition to telling this story, China’s Search for Security also touches on the melting will of Western countries to take hard (economic) action to punish China’s human rights violations in light of China’s economic ascendance. Overall, the authors grade Beijing’s soft power as proving a challenge to Western norms, yet severely limited due to the appeal of democratic values. Nathan and Scobell vision for the best Sino-U.S. arrangement is the current international regime with China’s security fears assuaged through playing a more influential role. Strategic conflict is not inevitable. Washington must “[draw] policy lines–military, economic, and political–that meet its own needs without threatening China’s and [hold] to them firmly” (357). Two areas are highlighted: U.S. military superiority in the western Pacific and maintaining the current global regimes crafted by the U.S. and allies. In both, room can be made for China without compromising U.S. core interests. While they offer a persuasive account of the Chinese political and strategic calculus, the concluding policy recommendations seem like a leap of faith without proper justification. Their general policy recommendations and desired outcomes run contrary to what most would think of as a “realist” conception of international relations. Readers naturally wonder how this cooperation is possible while realism’s assumptions hold. The security dilemma alone poses a problem for Sino-U.S. military relations in the Pacific. A predominance of U.S. force projection will, according to the realist tradition, foster insecurity among the Chinese. Surprisingly, Nathan and Scobell do not address this seeming contradiction or paradox. The strengths of China’s Search for Security are many, but chief among them is its ability to get readers to consider the Chinese perspective on the international environment and the threats it faces. This is demonstrated time and again in Nathan and Scobell’s analysis of Chinese threat perceptions in the four rings and the reasons and ways Beijing has developed its power. The weaknesses are not in the arguments, barring the aforementioned policy recommendations, but in the lack of follow-through. The ideas discussed in the introduction remain present, but latent, in subsequent analyses. With the sprawling amount of material covered, readers may lose track of the authors’ main arguments regarding China’s realist calculations. This by no means should dissuade potential readers from picking up this book; rather, it merely requires readers to pay closer attention. Comprehensive, persuasive, and empathetic, China’s Search for Security offers a fresh look at what could easily be a stale litany of threats to China’s rise.